Fresh garlic and onion, butter, chicken broth, mineral salt, ground pepper, dried oregano, sour cream, and heavy cream, are added to the chicken thighs (or you can use chicken breasts, if you prefer) and white kidney beans to make up the rest of the chili’s phenomenal flavor. Since a pot of this chili will yield at least 10 servings, there are not enough beans in this creamy white chicken chili (less than 1/4 cup per serving) to put you into S Helper or Crossover mode. 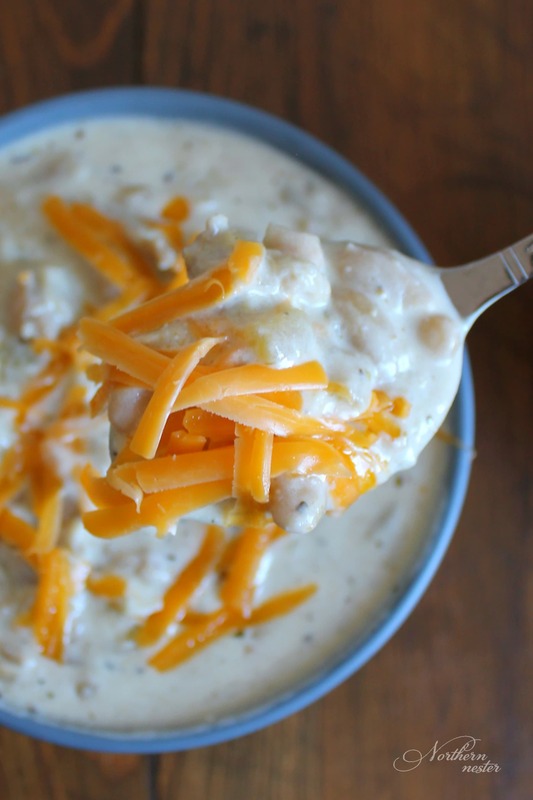 You are welcome to add more if you’d like to enjoy one of those fuels instead of an S.
This Creamy White Chicken Chili couldn't be easier or tastier! A delicious alternative to beefy, tomato-y chilies. A no-special-ingredient THM S.
Melt butter in a large saucepan. Stir in chicken, onion and garlic, and cook for 15 minutes or until chicken is no longer pink and juices run clear. Add in beans, broth, chilies, and spices. Bring to a boil. Reduce heat and simmer for at least 30 minutes (or all day, if you prefer!). Remove from heat and stir in sour cream and whipping cream until smooth. Serve immediately. Since this is an S meal, you can serve it with a generous sprinkling of grated cheese on top! White or yellow cheddar is my favorite. Suggestions for dairy free? Will coconut milk or cream work? Well, I put it all in the instant pot and have it going so I hope so. I added Daikin radish and a little chopped celery to make it full bodied as I had them on hand and plant to,add a bit of fresh chopped cilantro before serving. I can’t have dairy so may top with avocado and black olives. Sometimes if I have coconut yogurt on hand I dub,it for sour cream, but none on hand right now. Would it be possible to make this in the Instant Pot & if so what modifications would be needed? I am fairly new to my I. Pot & this is the best looking recipe I’ve seen for White Chicken Chili but want to make in my IP… Thank you for sharing this with us! God Bless you & yours this Christmas season. Not realky, but I’m not afraid to experiment. What’s the carb count on this? About how many pounds of chicken is this? Just curious – how is this an S with the 2 cans of beans? Ah, just read and found the answer to my question! I can’t eat the beans. What would you suggest replacing them with? I made this for the first time this week and it is definitely a keeper! It was delicious. Thank you for sharing! Not very often my kids give meals a thumbs up and actually eat the whole thing! Very flavorful. I used chicken I had already cooked and shredded previously which made it even simpler. Hardest part was opening the cans-ha! Didn’t put the cayenne because my kids say anything is spicy, but it would have been even more delicious for my husband and I with it. Thank you! I picked up Great Northern Beans instead of white Kidney Beans. Will it be okay?